Thank you all for your encouragement regarding my last post and culture shock. I think from now on I will refer to it as transition shock because I feel like that is a more accurate term. Anyway, your kind words and prayers meant a lot to me. Since the last post (even before for some) we have all been sick! I use an exclamation point to feign excitement, because it got to the point where if we didn’t laugh about it we would have to cry. Theo had been coughing a couple of weeks ago, got better, then got worse. It ended up being Bronchitis and an ear infection. Nana ended up with what Theo had, then got a stomach/intestinal thing to finish out her portion. After about 10 days she is finally better now. Tate started coughing Thursday, and Mark and I are bringing up the rear with starting to feel bad this weekend. The boys turned a corner Tuesday and were finally back in school yesterday (oh how I had missed my quiet mornings!) and hopefully within a couple of days we’ll all be back at full strength. Yesterday it was raining when we woke up. It was so wonderful, just like home. I had a pumpkin spice latte (thanks again, International Delight!) and soaked up the familiarity of waking up to rain. There’s something calming about it. I love waking up to sun, don’t get me wrong, but sometimes the sun makes me feel like I have to jump out of bed singing…and that’s not really me. I (occasionally) enjoy the quiet, contemplativeness of rainy mornings. I enjoy snuggling in my bed when it’s cold outside. A couple of hours later I enjoy that it’s burned off and I can be productive! Being sick made it hard for us to enjoy our “open house” policy, but I’m still glad we have it. I think we may need to get a sign for our window to let people know when we’re up and when we’re asleep, but the kids have all been really good about not just barging in if the door is closed and the lights are off. I came home the other night to all of the boys having a meeting at our house. They were meeting there to make sure that Tate and Theo didn’t wake up (Mark and I each had a meeting outside of the house). When I got home and they had to move back to their house there was grumbling and I heard them saying, “but we’d rather be here!” It made me feel really good…the work we’re doing to make sure that our home is welcoming and open to everyone is being noticed and felt. My next goal is to get one of the boys to make this for me.. 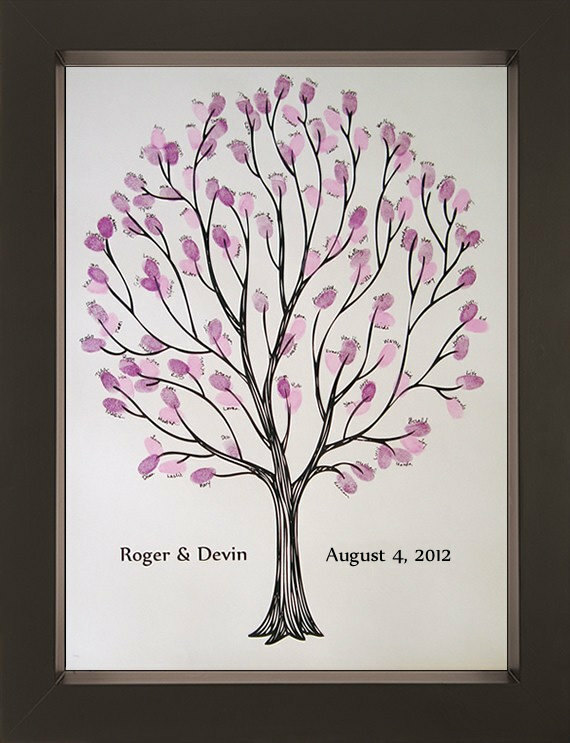 Since we’re already married, the idea will be to have the boys who have worked with us and helped us build our home put their fingerprints and names on our tree. We’ll frame it, but not put glass over it because we want to always be able to add to it. I won’t be using pink, but probably a mix of colors. I’ll put up a picture when it’s done. Jonathan (one of the older boys who is studying graphic design) told me he’d get it done this weekend and I’m pretty excited to see how it turns out! Our room is inching closer to being ready for a tour…I’ll keep working on it!